Cookies, cakes, pastries, pies, artisan breads, delectable desserts and much more! Bakeries are incredible places. Owning a bakery gives you the opportunity to share your passion with everyone else. What type of bakery business do you want to run? High quality artisan bread bakery? Or a traditional shop offering customized desserts and cakes? Whichever you choose, having the right equipment is essential for the success of your new venture. This is the most important investment when starting your bakery venture. All of the hard work and preparation that you put into your product culminates in the baking process. 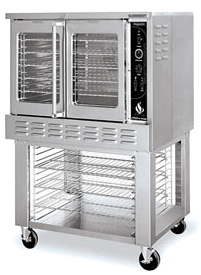 A high quality bakery oven will assure reliable and consistent products for years to come. You have four different bakery ovens to choose from: convection ovens, stone hearth deck ovens, rotating tray ovens and revolving tray ovens. With different functions, choose the one that suits your business. These are perfect for producing consistent and uniform buns, rolls and small loaves of bread. Dough divers are available in round, square and octagonal shapes. They have the ability to divide and round your dough at the push of a button. The perfect dough is now ready for molding into different types of shapes. These are referred to as the great multi-tasker of every bakery. They utilize a table that passes the dough back and forth between two large rollers. You can effectively sheet your dough thinner and thinner by lowering the roller with each successive pass. A cutting attachment, though optional, when attached allows for more versatility in sheeting donuts, pie crust, donuts and much more! If you plan to specialize in products that require rising dough such as bread, pastries or anything else, a proofbox will be a valuable addition. They give you precise control over the temperature and humidity that allows you to control the proofing process of your product. This control over the proofing process also affords you some leeway in your production planning. Choose the one that will suit your bakery! Great baking starts with a great mixer. The mixer you choose will depend on the volume that you wish to produce. The most common type of mixer found in bakeries today is vertical mixers, also known as planetary or orbital mixers. These mixers are available in different sizes, from table top units to large floor models. A spiral arm mixer will suit your business if you work more with yeasted dough where dough temperature and gluten development are a concerns. If you plan on opening an Artisan bread bakery, a spiral mixer should be your choice. Looking for the perfect equipment pieces for your new bakery business? Get in touch with Chef’s Deal Restaurant Equipment. They offer one of the best restaurant equipment solutions at affordable rates. The company is your one-stop restaurant supply store with over 200 equipment manufacturers on their portfolio.